Berliner Zeitung, in a tribute of past Charlie Hebdo covers, mistakenly included an anti-Semitic imitation cover by Joe le Corbeau. A German newspaper accidentally published an anti-Semitic cartoon on its front page, under the incorrect assumption it was a previous cover of the satirical French weekly Charlie Hebdo, Israeli newspaper Haaretz reported. Charlie Hebdo's editorial offices were attacked last Wednesday by two radical Islamic terrorists who murdered 12 people. Beliner Zeitung, the German daily, paid tribute to the French magazine a week ago Thursday by publishing several of its past covers, which usually feature mocking religious cartoons. One of the supposed covers, however, was a fake. The cartoon, drawn by anti-Semitic French illustrator Joe le Corbeau, depicts a hareidi Jew replete with traditional garb and a stereotypically large nose. The caption reads “1 million rebate out of six, for Palestine,” making a wordplay that suggests both rabbis and rebate in German. The cartoon and erroneous cover was noticed by people working at the Israeli embassy in Berlin. 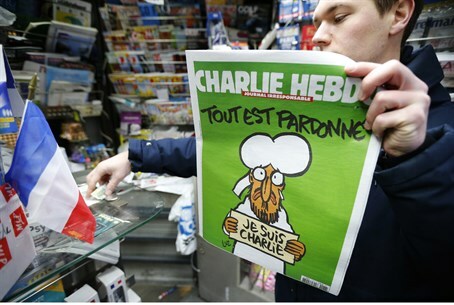 They alerted the editors of Berliner Zeitung to several details of the cartoon proving it was not a real Charlie Hebdo cover. These include the fact that the name of the magazine on the anti-Semitic "cover" is Charlo and not Charlie. Additionally, the barcode at the bottom of the cartoon is 6,000,000 - the number of Jews massacred in the Holocaust, but not a real barcode number. Embassy officials also noted that the pineapple that appears in the orange banner over the cartoon is a reference to the song "Shoananas", by anti-Semitic French comedian Dieudonne M'bala M'bala. "Shoananas" is a mashup of the Hebrew word for the Holocaust and the French word for pineapple. The term, which was later made a song, is used to suggest the genocide never happened while dodging France's anti-incitement laws. The comedian, who was arrested Wednesday for inciting terrorism by voicing support for French anti-Semitic terrorist Amedy Coulibaly, boasted of posting the fake tribute on his website. Berliner Zeitung subsequently apologized for posting the erroneous cartoon.